Free Online Photoshop Editor tool let you design your graphics or create new images to design it within the browser without installing any software on your computer. With its more useful and powerful tools, you can edit your images on the web and will feel just like you've installed a photoshop on your computer because it gives you all the options that the photoshop gives. The best thing about this is that it never ask you anything to pay or even to register yourself in order to use it. As you all know that adobe photoshop online is considered as the best photo editing software but it is an expensive software too. If you haven't enough budget to pay for this expensive tool, you need a free app. Here what we came with. In this post we will be introducing an innovative online free photo editor that let you edit your photos online for free. My research found it very useful and hope you will also find it helpful in order to design creative photographs images on the web. Everyone may have their own different reason for using web-based photo editor but for your info, I had listed some most common reasons that led you to make use of free online photoshop editor. You don't have enough budget to pay for the adobe photoshop or other photo editing software. Online photoshop editor can also be used if a user need only one or few photos to be edited, you don't need it on regular basis. You don't want to install a heavy software on your machine because it slows down you computer. You want to edit a photo from URL. without downloading the image to be edited. You've an image on pixlr, facebook or other library and want to upload and edit it directly without downloading it to your computer. Almost all the tools that adobe's photoshop have. Good tool for drawing online. Lots of brushes to select and use. Free Photo Effects and much more. Now if you're ready to create interactive images online with using the free online photoshop editor then here is a step by step how-to guide for you that how you can use this web-based photo editor to design creative images. 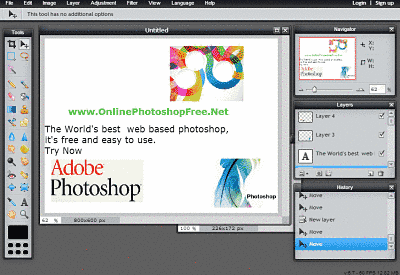 As usual, You've to visit Online Photoshop Free Editor website. Create New Image: This refers to start from a blank image. 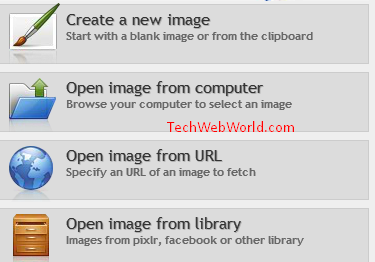 Open image from computer: Use this option in order to browser you computer and open an image to make editing online. Open image from URL: By choosing this option, you will required to enter an URL to open and edit the image. Open Image from library: This option is chosen in case you've an image on the pixlr or other libraries and you want to browse it. After choosing your image, the tools reveals and you can start using the free online photoshop editor to design your images. At the menu bar you can see options like File, Edit, Image, Layer, Adjustment, Filter, View and language and those can be used when you're required. For example, you want to resize the image, you can use Image option and can select image size to change the height and width as you required. Similarly you can hover the mouse cursor on the Adjustment to change the brightness and contrast, hue & Saturation, change posterize level and much more. Crop Tool, Move Tool, Marquee Tool, Lasso Tool, Wand Tool, Eraser tool, gradient tool, smudge tool, red eye reduction tool, text tool. In short there are about total 30 tools available which are unlocked and can be used when you need. At the left side, you can see the three windows boxes of navigator, history and layers. So what are you waiting for? Visit this website and start designing your own photographs using this free online photoshop editor. I personally used this many times and works very well for me and I highly suggest you to use this free web-based photo editor in order to edit photos with awesomeness. That's it dear readers. In this post we shared a web-base online photoshop editor free and hope you found ti useful and helpful. Don't forget to share your views with us about this tool. Also do share this post on your social networks profiles and let your friends also get benefit from it.